Build your own valve guitar amplifier with our 40W Lamington III Amp Kit, just $395 + postage (includes $49 construction manual). The Lamington III amplifier is the amp if you are looking for loud clean tone. With 40W output, it provides big Fender cleans with its heritage drawn from vintage Australian Goldentone amps. An amp that really shines with outboard dirt pedals for huge drive tone. Amp building is a fantastic way for a guitarist to get in touch with the technology of valve amps. It deepens your understanding of tone and the inner workings of your amplifier. Plus, there is nothing like playing through an amplifier that you have built yourself! The Lamington III Amp has the characteristic big loud clean tones of higher power Fender amps. The amp Kit includes all the parts necessary to build your own Lamington III 40W valve guitar amp. Just supply some basic tools and you are on your way. 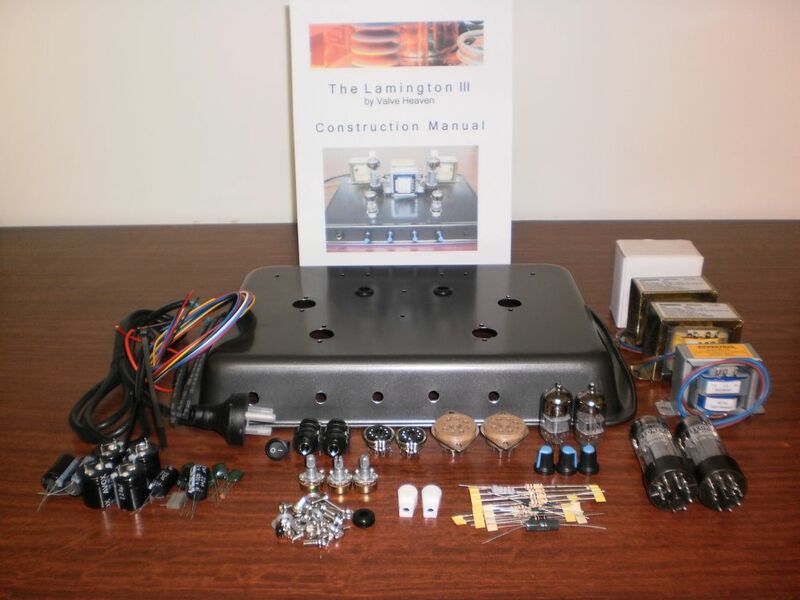 The kit includes the very comprehensive Lamington III Construction Manual valued at $49 which provides step by step guidance as you build your amp. Some great suggestions are also included with the kit to mod your amp to provide for more tone options. What do I need to build my amp? You simply need a few basic tools a soldering iron and solder, Philips screwdriver, pair of pliers and a pair of sidecutters. The completed amplifier chassis can be mounted in a headshell or a combo cabinet (not included). Suggestions for completing your amp are included in the manual. Hi Grant, looks cool! I’m in for a LamIII kit when they’re available. Have just released the Construction Manual for the Lamington III amplifier – detailed step by step instructions for successful construction of this 40W amplifier! The Lamington III kit is now also available! Is there any kit valve amps designed for bass guitar? Or will the Lamington III do the job ok? Thanks for your enquiry. The Lamington III is certainly suitable for a bass amplifier with its higher power output. It is similar in power and sound to a Fender Bassman. Has anybody built a lamington III for a bass guitar? Any modifications required for the tone circuit? I am looking at driving an 8 Ohm GK 15″ speaker. The guitarist I play with uses a 15 watt valve amplifier, and I run at around 20 to 33% of a 125 Watt 8 Ohm solid state head. I think I would be fine for power though. I would like to build something like the Lamington III but be able to overdrive like the Lamington 15W instead of just clean. Wondering if this is able to be done. Thanks. Hi will the lamington lll handle a 16 OHm or even two 16 OHm speakers? Hi Grant, would it be possible to fit a PPIMV to the Lamington 3? A dual ganged pot in place of R17/R18 perhaps? Thanks. Hi Dave, yes you could add a post phase-inverter master volume to the Lamington III in the way you describe. However, the Lamington III design does not have a high gain preamp so that the benefit of a PPIMV would be lost somewhat.